So in that vein: Hi, my name is Nick Ford and I have autism. More specifically, I have aspergers which is a “mild” variant of autism. The month of April is known to many autistic folks as Autism “Awareness” Month but for some of us, this simply isn’t good. Anyone can be aware of us, anyone can take notice of those who have to put up with ableism in their life. But none of that means you’re actively trying to make that person’s life better by treating them with the respect and kindness they should get so long as they treat you the same. “Awareness” is a campaign put on by an organization named Autism Speaks which is a very controversial (see also here) organization. 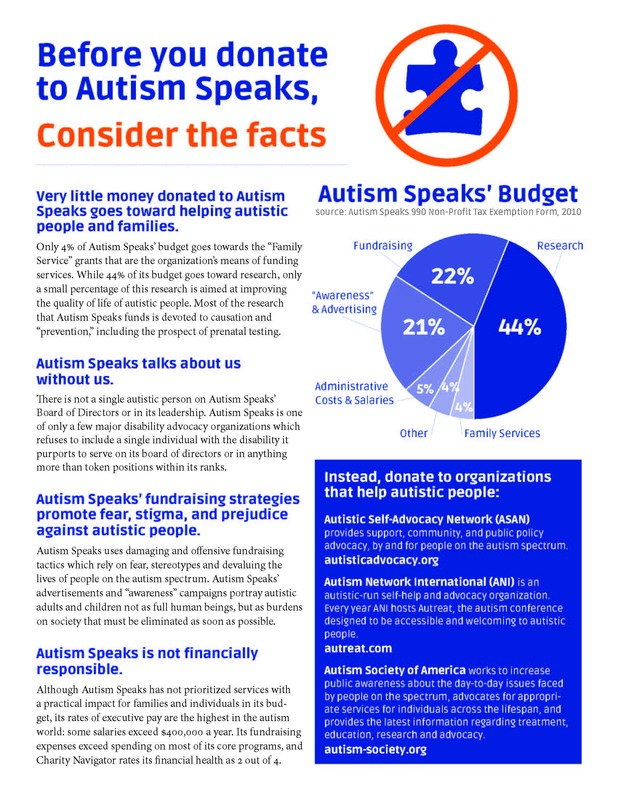 3) They have very little financial accountability and very little of their money actually goes to researching and helping people with autism. They did have one autistic member higher up in their organization at one point (though not at the board level)…but he quit. This, as far as I am aware, hasn’t changed. They do have an acceptance page but I’ll go over that another time to see how good it is/isn’t. For 2010 here was their results broken down, they have more recent years if you want to see if they’ve done better but without handy graphics it’s hard for me to tell, honestly. So why acceptance and not awareness? Here’s some steps you can take to improve acceptance of autistic folk and here’s a much longer list if you’d like to learn even more! I’ll have much more to say when I’m not so exhausted from my other writings and travels but for now I urge you to consider the rights of autistic folks and how “awareness” simply isn’t enough.